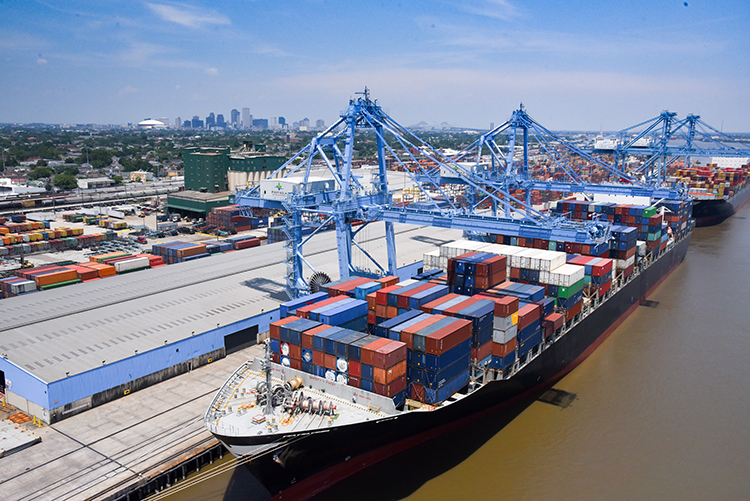 The record marks the fifth year in a row Port NOLA has surpassed the half million TEU-mark at its Napoleon Avenue Container Terminal, which is operated by New Orleans Terminal and Ports America. The arrival in October of the Pusan C, a 9,500-TEU vessel operated by Marsailles, France-based ocean carrier CMA CGM, marked the largest container ship to ever call on the Port. Port NOLA is also growing the nation’s largest container-on-barge service, in partnership with the Port of Greater Baton Rouge and operator SEACOR AMH. In 2018, that service moved 26,759 TEUs by barge, up 58 percent compared to 2017. The service repositions containers from Memphis, Tenn., to Baton Rouge, La., where they are loaded with plastic resins and shipped by barge to Port NOLA to be loaded onto container ships for export to global markets. Another driving force for container traffic is its growing intermodal service to critical markets Port NOLA serves. Intermodal cargo volumes realized 15 percent growth from 2017 to 2018. Intermodal services by CN Railroad into Memphis, Chicago, Detroit and Toronto and Kansas City Southern’s weekly service into the Dallas-Fort Worth market are critical inland markets that will further grow volumes in New Orleans.